As the weather turns colder the quest for outdoors adventure starts to come to an end for some. For others the fun is just beginning. Hiking in the fall and winter can be extremely rewarding. The absence of crowds, less restrictions and a greater chance of seeing wildlife are some of the benefits of continuing to explore even after the days get shorter and the mercury starts to drop. A critical component of enjoying hiking (or its wintertime cousin snow shoeing) in the colder months is wearing the right clothes. Although our forefathers climbed mighty peaks and explored the arctic reaches wearing cotton, fur, wool and leather, new synthetic materials available today can do the same job more efficiently and with far less bulk. When dressing for colder weather you need to consider your internal thermostat. Do you normally run hot or cold? Does the though of wearing a pack make you break into a sweat or are you wearing a long sleeve shirt and shivering on an eighty degree day because there is a light breeze? If you tend to run cold then heavier clothing will be in order, if you tend to run hot than multiple layers will probably work better. The best way to keep warm is by wearing layers. Insulation works by trapping air in tiny pockets that then retain heat, forming a bubble of warmth around your skin. Each layer traps more air, allowing more warmth to be captured. The more layers you wear, the warmer you will become. This is why down is such a superior insulation material and who fur on a polar bear is actually silvery hollow tubes. If we make you a virtual onion we can peel down the layers that are key to keeping you warm. Layer Five - Protecting The Extremities: Keeping your hands, feet, head and face warm is critical when you are in the outdoors. These outer areas are the most likely to be affected by frostbite and half of your body heat escapes through your head. In the case of keeping your head warm two hats are better than one. A light cotton blend or synthetic material to help wick sweat away and keep itchy wool off your head aids in comfort. Fleece, wool, and synthetic materials are superior as an outer layer. Your outer shell (that is part of layer four) should have a hood to help keep your head dry when it rains or snows. In more extreme situations a facemask might be needed to protect you from the biting wind and frostbite. Be sure to pick a synthetic material that breaths well otherwise your condensed breath will accumulate and freeze on the mask around your mouth and nose. If the wind chill is going to dip below zero total protect is required. Glacier glasses or ski goggles can provide protection to the skin around your eyes, and will aid in keeping your eyeballs from feeling like they are going to freeze. For your feet layers work best also. In the fall and winter you should wear two layers of socks. An inner liner sock of synthetic material should be worn to wick moisture away and an outer sock of Wool, VVS� or CoolMax� blend to add insulation will help keep the cold out. Boots with liners can help provide additional warmth, but will only be able to provide you cold weather duty. If you will be hiking in a damp environment like the Pacific Northwest than gaiters can help keep your legs dry and water out of your boots. When it comes to your hands two layers also work best. An inner layer of a glove, preferably of a light and thin synthetic material works well. Even natural wool can provide you good protection. The outer shell should be a mitten. Mittens offer more insulation than gloves and provide more overall comfort. When it comes time to use your hands you can remove the shell while keeping your skin protected by the inner glove. 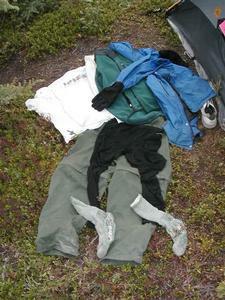 Gore-Tex� and treated synthetics are best for a shell, but can be expensive. If your hike in the winter is going to require you to swing an ice axe then a glove shell will offer you a better grip. Learn even more about layering clothes to stay warm, read more NOW!